I love salmon! Packed with omega-3 fatty acids along with other nutrients like calcitonin, vitamin D, vitamin B12, selenium and many more, eating salmon is one of the best things I can do for my health. By adding flax meal, I’ve added even more omega-3’s and fiber and kept the cakes low-carb and gluten free by avoiding breadcrumbs. The following recipe makes 6 servings and leftovers can be frozen or refrigerated for another meal. The salmon cakes taste great hot from the oven and cold the next day. Either way top them with the creamy dill sauce. Yum! Mix sauce ingredients thoroughly and refrigerate to blend flavors. Preheat oven to 425o and lightly grease muffin tin. In a separate bowl, mix well the ricotta cheese, flax meal, and eggs, salt, and a little freshly ground pepper. Chop onions and allow them to rest for 5 to 10 minutes to allow healthy compounds in the onions to fully develop as they are exposed to the air. Meanwhile, chop the celery and the parsley. Cook the onions and celery in the oil over medium heat until they are soft. Remove from heat and add the parsley. Add the onion mixture to the salmon and combine thoroughly. Then add the ricotta-flax meal mixture and stir until completely combined. Spoon into muffin tin, lightly packing down to remove air spaces. Don’t be afraid to heap the mixture a little. Bake for 20 – 25 minutes or until golden brown on the tops. Remove from oven and let cool for a minute. Gently loosen with a knife and lift from the muffin tin. Serve with lemon slices and Creamy Dill Sauce. Leftovers may be stored in the refrigerator or freezer. 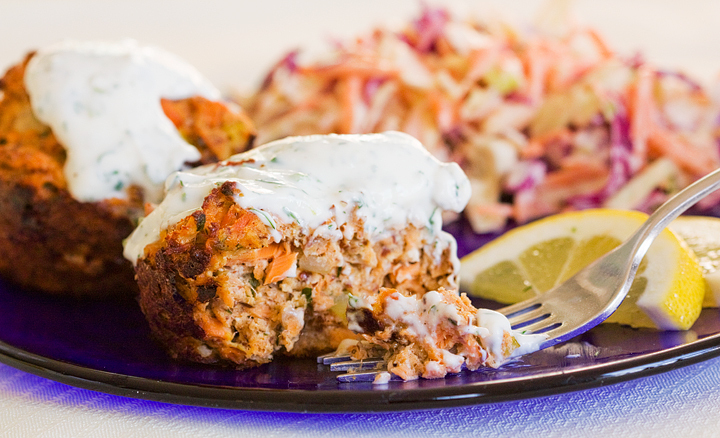 Makes about 1 dozen salmon cakes – two cakes per serving. Looks delicious! Love love salmon too! Is flax meal the same as ground flax seed? Yes, Lisa, it is. If you buy it already ground (as meal) I would keep it in the freezer to keep it from going rancid before you use it all. If you buy the whole seeds, grind them as you need them and it will stay fresh a lot longer. Thanks. The recipe looks great! They are delicious and they freeze really well!